Seeds are an economical way to produce plants for your garden. 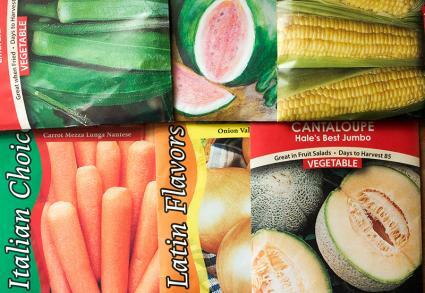 Compared to the selection in most local nurseries, online seed catalogs have made a vast number of botanical varieties available from the comfort of your home, but the irony is that shipping charges are sometimes greater than the price of a seed packet. Before you order, review some of the seed suppliers that offer free shipping, and access the tremendous selection of seeds online for the same prices that you would pay in the store. Many seed companies offer free shipping only for customers that buy a certain quantity, but here are a few that will ship even a single packet of seeds without charging you for shipping. Cheap Seeds offers free shipping on all orders, as well as a 30-day, no questions asked money back guarantee. Their per packet seed prices ($3 to $4 each) are a bit higher than what some other budget seed companies offer, but Cheap Seeds does boast a much higher seed count per packet than most seed sellers. My Seed Cellar is an online purveyor of herb and vegetable seeds who offers free shipping on all of their products. The only caveat is that you must be in the United States to qualify for the free offer. They offer high quality non-GMO heirloom seeds, but their selection is slim - only 33 varieties of vegetable to choose from. The focus at My Seed Cellar is in selling seed 'kits' that include a number of different varieties with extensive information on how to grow them. Planet Natural's collection of heirloom herb, vegetable, and flowers seeds comes with free shipping. They offer lots of free growing information and other guides to a natural lifestyle, but when it comes to seeds, the downside is they have a relatively small selection compared to the companies who are solely seed providers. Planet Natural also sells numerous other organic gardening products, for which standard shipping charges generally apply. Mystic Seeds has a fascinating selection of rare and unusual flower seeds - unfortunately it's very small, with only about 20 varieties to choose from. But if they happen to have something you're looking for, their shipping is free. The following seed companies offer free shipping based on a minimum order or other restrictions. High Mowing sells herb, flower, and vegetable seeds and offers free shipping on orders over $10 to all customers in the continental U.S. Their seed prices are on the high side, but they sell exclusively organic seeds which always cost more because they are more labor intensive to produce. American Meadows specializes in wildflower seed, but also offers an enormous selection of other flowers, as well as grass seed and vegetables. They offer a special line of 82 'ready-to-ship' seed mixes marketed as gifts for special occasions that come with free ground shipping. On the downside, if you want to order any of their other products, including other seeds, their shipping rates are unusually high - $6.95 for a $10 order, for example. Mary's Heirloom Seeds offers free shipping on heirloom fruit, vegetable, and herb seeds. However, all orders must be for at least $10. Mary's is a small company that lacks the selection of a large retailer, but they do have some interesting perks like the Seeds of the Month Club. This is a membership program where you get new seed packets each month for a year. Seed Corner offers a wide, general selection of seeds. All orders over $25 are shipped for free to U.S. addresses. For international orders, the free shipping threshold is $50. They are a relatively new company that doesn't have the long-standing reputation of the more established companies, but they are great way to get cheap seeds. Besides the free shipping, packets start at $1.99 and you can use their coupons on the main page to get even more discounts like percentages off orders. Seeds Now offers herb, vegetable, and sprout seeds with free shipping for orders over $30. Otherwise they charge a modest $2 in shipping for each $10 of product ordered. They are a new company, but the selection is impressive and all their seeds are 100% GMO-free. Their prices are extremely low, they offer tons of free growing information and their seeds are packed in resealable foil packets that preserve quality much better than conventional paper packets - in short, it's hard to find any disadvantages to buying from a company like this. Park Seed normally charges for shipping, but there is a couple ways to get it for free. The first is to purchase from their list of seeds and supplies with free shipping, which contains about 40 of their products that ship for free (no minimum). The second is to subscribe to their email list, which they reward with a coupon for free shipping on orders of $40 or more. However, it must be noted that there seed prices are exorbitantly high and they could potentially change their email list reward coupon at any given time. Johnny's Selected Seeds is one of the top names in the seed business, catering to both home gardeners and commercial growers. They have a very high minimum order of $200 to qualify for free shipping that is clearly geared toward professional growers, but is worth mentioning in case you are planning a large order - you can always join with your friends to make a group order! A packet of seeds is a wise investment, from which beautiful and bountiful harvests may follow. Keep your costs to a minimum by ordering from the companies that offer free shipping and set your sights on a successful season of gardening.